First is Chicken Tatsuda Don (399 yen), with salad bar selection (oranges, broccoli, half egg). Next is Katsu Meat Plate (441 yen) that is basically tonkatsu, meat sauce, and scrambled eggs on rice plus shredded cabbage, that I got with almond jelly and orange dessert (84 yen). Last is Pork Ginger Tomato Sauce (294 yen), with spinach side dish and "M"-size rice. Chicken katsu (a little bit irregularly shaped compared to the normal katsu stuff) with demi-glaze sauce and cheese that doubles as pasta sauce for the fettuccine bedding. Rice with black & white sesame seed sprinkles, similar to the last one. Egg, broccoli, and onion side salad. 498 yen, again from the 3F convenience store. I'm starting a new series on the Japan! Japan! Blog about bento meals I eat while in Japan. Bento, as you know, means "lunch box," and so you shouldn't really say Bento Box because that would be like lunch box box. What a 1-2 punch that would be. Anyway, I'll post this series mostly from my mobile device while on the go (so please excuse typos and what not), and almost instantly, and let's see where we will go with this. These bento meals, I usually buy them at convenience stores (konbini), but they're also available at supermarkets and even some restaurants and stand-alone bento stores. Hope you like this series! This first one features rice, of course, but sprinkled with black and regular sesame seeds. Corn and spinach on the side. Some spaghetti and bean sprout bedding for the main course, which is two pieces "ebi furai" - fried non-tempura breaded shrimp - with tartar(?) sauce and (pork?) burger with "demi-glaze?" (i.e. sweet) sauce. 550 yen. Yes, expensive. My first experience of outlet malls were in Northern California, practically 20 years ago already. I remember US$1.00 GAP t-shirts and what not. Not having that much money then though, I think I just settled for a GAP cap (I love owning GAP caps) and I think a belt and maybe one or two shirts. It might have all cost me just under US$20. This is 20 years ago, though. During that time maybe those GAP shirts were selling for like $5 to $7? Unfortunately, that's what I look for still - shirts for a steal. Nowadays, GAP shirts are like $10 to $20 or more, and I'm happy to find $5 shirts at outlet stores or on clearance sale racks. I also look for shoes at outlet stores, and I'd usually go for $40 shoes (that were previously as high as $150 maybe), and if there's something I really want I can go for as much as $60 on shoes. Any more than those prices, no way. I might have bought watches, too, and maybe I would have $40 to $60 upper limits on watches as well. I've had outlet mall experiences in other parts of California, as well as in New Jersey where I think there's no tax on wearable items. I've had some outlet store experiences in the Philippines as well. But basically, I have my $5 and $40 limit on shirts and shoes and watches as I mentioned. Now when I heard about the Premium Outlets in Japan, I got sort of excited. But that excitement didn't last very long. 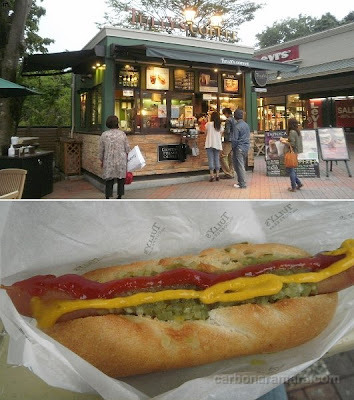 The nearest one is in Gotemba. It's at least an hour and a half from my place. Too far. That's the one problem with these outlet malls, though. They're in far away places because they need the really low real estate values so that they can still realize profits. However, a couple of good friends visited Japan, and they wanted to tour the Fuji-Hakone area. They found out about the Gotemba Premium Outlets, and wanted to go make a side trip there as well. As you might know, I already posted my Odawara-Hakone-Gotemba-Fuji video a few weeks back, and to the Premium Outlets we went indeed. Guess what stuff I found and bought? Nada! Everything was still way expensive. The cheapest shirts I can find were $10. And these are plain, meant-as-undershirts kind of stuff! 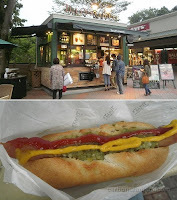 Anyway, even the restaurants there, except for McDonald's maybe, are a bit on the expensive side as well, and we just settled for Tully's Coffee hotdog sandwiches, which we could find all around Kanagawa and Tokyo as well. So we went home with nothing except... And this is the best part. And you've probably seen this already in my O-Ha-Go-Fu video: The best views of Mt. Fuji! I think with the trip to the Premium Outlets practically "free" since it was just a side trip for our Hakone Area tour which was already paid for, I think it was worth it. Unfortunately we did get there when there were more clouds in the sky already and so it wasn't the most optimal sighting of Mt. Fuji. But it felt great nonetheless. Imagine, (window) shopping with Mt. Fuji in the background. Anyway, if you wish to go to the Gotemba Premium Outlets from the Kanto (Tokyo/Kanagawa/Saitama/Chiba) area, check out their website by clicking this ad-supported link. Or just take the Odakyu Line express or rapid express train bound for Odawara, get off at Shin-Matsuda Station, walk towards the JR Matsuda station and take the JR Gotemba Line for Gotemba. At Gotemba, there are free shuttle buses to/from the outlet mall. The last bus from the outlet mall going back to Gotemba Station is around 7pm, so make sure to catch that or else you will need to take a taxi. From Tokyo, Saitama, or Chiba, just go to Shinjuku Station to get to the Odakyu Line. UPDATE: If you are taking the Odakyu Hakone Free Pass like we did, it's a free ride around Hakone as well as to the Gotemba Premium Outlets as well. Can a picture say a thousand words? This we found at the souvenir shop at the observation deck of the Tokyo Metropolitan Government Building in Shinjuku, Tokyo, Japan. There's no entrance fee to go up there, by the way. It's around this time that "Ajisai" is in bloom. The festival itself is at different dates at different locations. For this one near the Shin-Matsuda station of the Odakyu Odawara Line (southeast of Tokyo), it's only until 6/17. Check out their official website. If you're from the Philippines and old enough, you've probably been to the Nayong Pilipino Park near Ninoy Aquino International Airport Terminal 2, where they recreated almost all of the Philippines' natural wonders. If Nayong Pilipino was to the Philippines, Tobu World Square is to the world. Almost. There are 1/25 scale replicas of different wonders from around the world, old and new, like Ankor Wat, the Pyramids of Egypt, the Parthenon, the Statue of Liberty, the Tokyo Tower, the Eiffel Tower, the White House, even the (old) World Trade Center's twin towers, La Sagrada Familia, the Great Wall of China, the Taj Mahal, and much more. Admission is only JPY 2,500 for junior high school students (12-year-olds?) and older, JPY 1,200 for ages 4 to 12. There are discounts for groups and persons with disabilities. Check it out on SayonaraJapan.com. Comes with a bonus footage of Minato Mirai at dusk. Check it out by clicking this link.